Do you want to clean up your followers and profile? A well-managed Twitter account improves your branding and helps you engage with your audience. 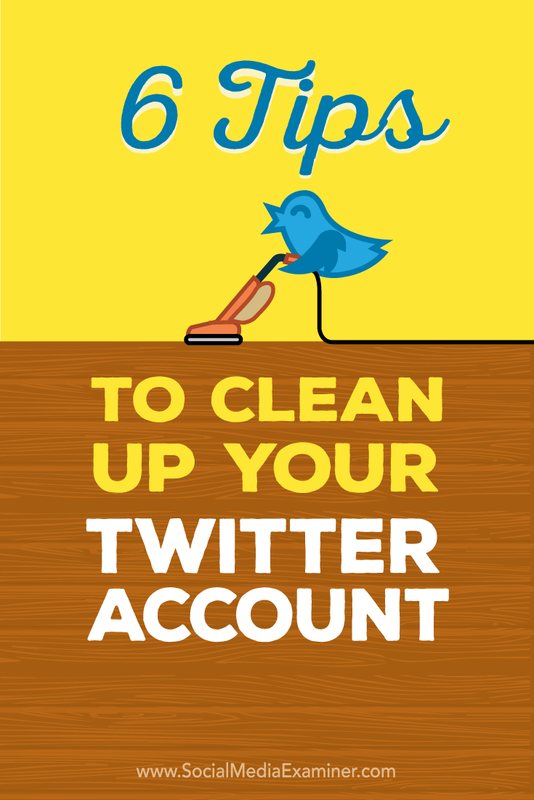 In this article you’ll find six tips to clean up and revitalize your Twitter account. Discover six tips to clean up your Twitter account. First, tend to the users you’re following. Let’s start with your family members. You know the ones. They started using Twitter in 2007 and haven’t been back since. They’re inactive users, along with potentially hundreds of other users you followed a long time ago, and never heard from again. 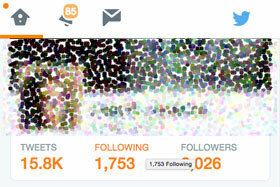 It’s possible to go through your Twitter profile, analyze each profile and unfollow them. If you’re following hundreds or thousands of people, that’s a waste of your time. You can use any one of numerous tools like UnTweeps. 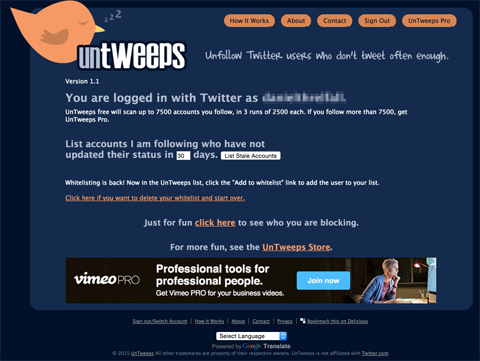 UnTweeps scans all accounts you follow and provides a list of the inactive ones. Decide what you consider inactive (how many days since their last tweet) and fill in the number. Decide how to filter the list in UnTweeps. Then check the boxes next to the accounts you want to unfollow. Check the boxes you want to unfollow. The idea is simple. Weed out all of the people you’re following who aren’t tweeting. If you’re following inactive users, then you’re wasting your follows. The maximum number of Twitter users you can follow is 2,000. Once you hit 2,000, you can’t follow anyone else unless you gain more followers. How many more followers? We don’t know. It’s a ratio, and Twitter keeps it a secret. Other tools to use to clean up inactive accounts include Tweepi, ManageFlitter, Follower Filter, Crowdfire and iUnfollow. After you’ve deleted some inactive users, take another look. You’re likely still following too many users who are irrelevant. There are some options. If you unfollow almost everyone, it seems rude and you may tick some people off. It takes time to unfollow only select people. But if you keep it the same, Twitter stays messy. For example, blogger Michael Hyatt chose to unfollow all of his followers. Hyatt used to follow back everyone who followed him: all 108,698 of them. Michael realized the volume of inbox messages and irrelevant tweets he was getting was out of hand, so he took drastic measures. Chris Brogan also went this route. He unfollowed 131,000 users. Another approach is to sift through the people you follow, identify the ones who are irrelevant and unfollow them. If you want to curate your follows in this way, here’s what to do. Go to your profile page, and click Following. Check everyone you follow to see if you want to continue. Look at each profile and decide if it’s worth following. To stop following a user, hover over the Following button. It should turn into a red Unfollow button. Click it. Just remember, if you’re following a lot of people, purging like this could take a long time. Some of the tools mentioned previously can assist with the process. Twitter lists help you organize the different purposes you have for Twitter: work, family, influential people, etc. Create as many kind of lists as you like. There’s no limit. To create a list, go to your profile page, click Lists, then Create a New List. 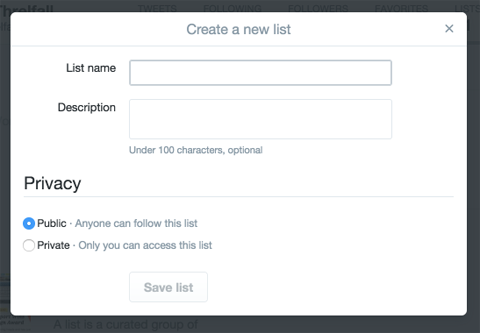 Create lists to separate the different types of people you follow. To add someone to a list, click on Following from your profile. Then, click the settings icon next to the user, and select Add or Remove From List. Then, check the box next to the list or lists to add the user, or create a new list. Lists are an excellent way to filter through the different types of people you follow. If you follow a lot of people, you’ll never see everything. This way, you can get the information you need from certain people whenever you want it. Depending on how you use lists, you may wish to keep your list private (for example, a list of competitors). Once your account is clean, get back into the Twitter swing of things. Another point for cleaning up your account is your Twitter profile. Your bio is your public identity on Twitter. If people know who you are and your expertise, then the right ones will follow you. To clean up your Twitter bio, revise and review the following items. First look at your name (this will likely not change, unless you’ve updated your professional identity recently). Then check your photos. Update your header or cover photo (1500 x 500 pixels), as well as your profile picture (headshot), (400 x 400 pixels). Also, choose your preferred theme color in the design tab of settings. 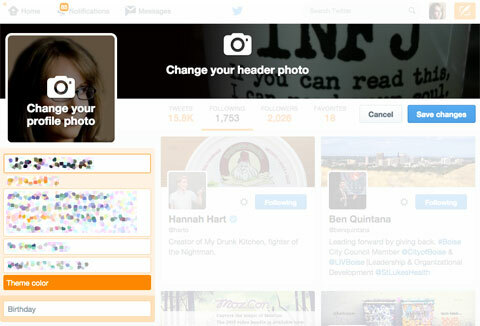 Make any changes by editing your Twitter profile. Next, make sure you have an accurate, brief bio (maximum 160 characters), and that your location and website are up to date. Finally, if you’d like, add your birthday. Note: you can adjust the visibility settings for your birthday. An excellent way to freshen up the look of your Twitter profile is to pin a tweet. A pinned tweet is the first tweet people see when they visit your Twitter profile, and it offers a sense of the kinds of things you tweet about. 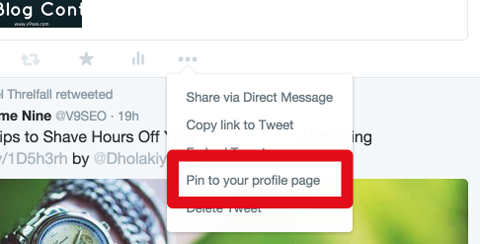 Plus, your pinned tweet can send people directly to your website or a target page. To pin a tweet, first go to your Twitter profile page. Pick the tweet you want to pin or tweet a new one. Click the ellipsis icon (three dots) on the bottom right of your tweet. Select Pin to Your Profile Page. Pin tweets to the top of your Twitter profile page for a fresh, clean look. To keep things fresh, change your pinned tweet every week or so. To unpin a tweet, go to your Twitter profile page. On the pinned Tweet, click the ellipsis on the bottom right. Select Unpin From Profile Page. Twitter accounts often look messy because we use them as an IM platform to tweet and @reply to other users. Someone who views your profile will not see a clean tweet, but rather a string of Twitter conversations with no context. A pinned tweet is a wonderful way to introduce followers and potential followers to who you are. Part of cleaning up Twitter is clearing out the stuff that you no longer want people to see. We’ve probably all posted a few dumb tweets or tweets with typos. So while you’re not yet able to edit them, you can delete them. To remove a tweet, click the ellipsis underneath it. Then select Delete Tweet. 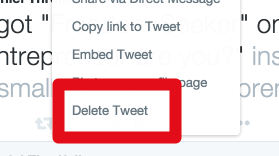 Click the ellipsis on any tweet you want to delete, and then choose Delete Tweet. Clearly you don’t want to remove everything from your Twitter profile. However, if there’s something that seems unprofessional and will show you in the wrong light, go ahead and delete it. There are many tools available to help you manage, schedule and better utilize Twitter. For example, use Buffer to schedule tweets and get analytics. TweetDeck offers real-time tracking and improved engagement. Hootsuite helps you manage multiple Twitter profiles and schedule tweets. Plus, try SocialOomph to schedule tweets, track keywords and enhance your Twitter profile. Looking for more? Buffer has a list of 91 free Twitter tools. 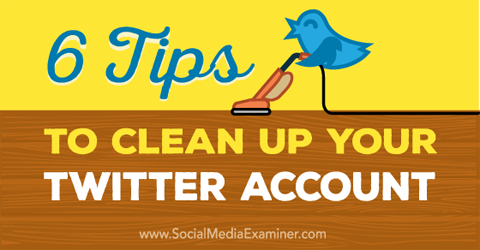 Cleaning up and getting organized gives your Twitter account the power it deserves. Yes, it takes time, but it’s worth it. What do you think? What have you done to clean up your Twitter account? Which tools do you use? Please share your thoughts and recommendations in the comments. Six tips for cleaning up your Twitter account.